Rocks often contain assemblages of ferromagnetic minerals dispersed within a matrix of diamagnetic and paramagnetic minerals. In later chapters we will be concerned with the magnetization of these assemblages, but here we continue our investigation of the behavior of individual particles. In Chapter 3 we learned that in some crystals electronic spins work in concert to create a spontaneous magnetization that remains in the absence of an external field. The basis of paleomagnetism is that these ferromagnetic particles carry the record of ancient magnetic fields. What allows the magnetic moments to come into equilibrium with the geomagnetic field and then what fixes that equilibrium magnetization into the rock so that we may measure it millions or even billions of years later? We will begin to answer these questions over the next few chapters. We will start with the second part of the question: what fixes magnetizations in particular directions? A basic principle is that ferromagnetic particles have various contributions to the magnetic energy which controls their magnetization. No matter how simple or complex the combination of energies may become, the grain will seek the configuration of magnetization which minimizes its total energy. The short answer to our question is that certain directions within magnetic crystals are at lower energy than others. To shift the magnetization from one “easy” direction to another requires energy. 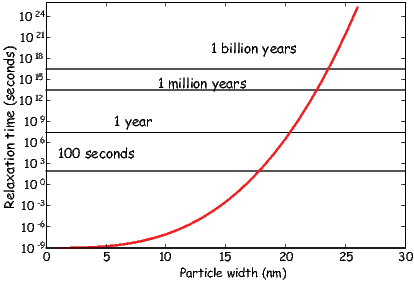 If the barrier is high enough, the particle will stay magnetized in the same direction for very long periods of time – say billions of years. In this chapter we will address the causes and some of the consequences of these energy barriers for the magnetization of rocks. Note that in this chapter we will be dealing primarily with energy densities (volume normalized energies), as opposed to energy and will distinguish the two by the convention that energies are given with the symbol E and energy densities with ϵ. In Chapter 6, we will discuss the behavior of common magnetic minerals, but to develop the general theory, it is easiest to focus on a single mineral. We choose here the most common one, magnetite. It has a simple, cubic structure and has been the subject intensive study. However, we will occasionally introduce concepts appropriate for other magnetic minerals where appropriate. The simplest permanently magnetized particles are quasi-uniformly magnetized. These so-called single domain (SD) particles have spins that act in concert, staying as parallel (or anti-parallel) as possible. As particles get larger, the external energy can be minimized by allowing neighboring spins to diverge somewhat from strict parallelism; these particles are referred to as pseudo-single domain or PSD. Eventually, the spins organize themselves into regions with quasi-uniform magnetization (magnetic domains) separated by domain walls and are called multi-domain (MD) particles. These more complicated spin structures are very difficult to model and most paleomagnetic theory is based on the single domain approximation. Therefore we begin with a discussion of the energies of uniformly magnetized (single-domain) particles. where Je is the exchange integral and Si and Sj are spin vectors. Depending on the details of the crystal structure (which determines the size and sign of the exchange integral), exchange energy is at a minimum when electronic spins are aligned parallel or anti-parallel. We define here a parameter that we will use later: the exchange constant A = JeS2∕a where a is the interatomic spacing. A = 1.33 x 10-11 Jm-1 for magnetite, a common magnetic mineral. Recalling the discussion in Chapter 3, while s orbitals which are spherical, the 3d electronic orbitals “poke” in certain directions. Hence spins in some directions within crystals will be easier to coordinate than in others. We can illustrate this using the example of magnetite, a common magnetic mineral (Figure 4.1a). Magnetite octahedra (Figure 4.1a), when viewed at the atomic level (Figure 4.1b) are composed of one ferrous (Fe2+) cation, two ferric (Fe3+) cations and four O2- anions. Each oxygen anion shares an electron with two neighboring cations in a covalent bond. In Chapter 3 we mentioned that in some crystals, spins are aligned anti-parallel, yet there is still a net magnetization, a phenomenon we called ferrimagnetism. This can arise from the fact that not all cations have the same number of unpaired spins. Magnetite, with its ferrous (4 mb) and ferric (5 mb) states is a good example. There are three iron cations in a magnetite crystal giving a total of 14 mb to play with. Magnetite is very magnetic, but not that magnetic! From Figure 4.1b we see that the ferric ions all sit on the tetrahedral (A) lattice sites and there are equal numbers of ferrous and ferric ions sitting on the octahedral (B) lattice sites. The unpaired spins of the cations in the A and B lattice sites are aligned anti-parallel to one another because of superexchange (Chapter 3) so we have 9 mb on the B sites minus 5 mb on the A sites for a total of 4 mb per unit cell of magnetite. ϵm is at a minimum when the magnetization M is aligned with the field B. Single-domain particles have a quasi-uniform magnetization and the application of a magnetic field does not change the net magnetization, which remains at saturation (Ms). The direction of all the magnetic spins could swing coherently toward the applied field. Yet the magnetizations in many particles do not rotate freely toward the magnetic field (or we would not have paleomagnetism!). There is another contribution to the energy of the magnetic particle associated with the magnetic crystal itself. This energy depends on the direction of magnetization in the crystal – it is anisotropic – and is called anisotropy energy. Anisotropy energy creates barriers to free rotation of the magnetization within the magnetic crystal, which lead to energetically preferred directions for the magnetization within individual single-domain grains. There are many causes of anisotropy energy. The most important ones derive from the details of crystal structure (magnetocrystalline anisotropy energy), the state of stress within the particle (magnetostriction), and the shape of the particle, (shape anisotropy). We will consider these briefly in the following subsections. 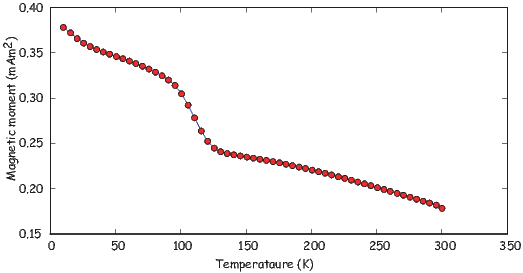 Figure 4.2: Variation of K1 and K2 of magnetite as a function of temperature. Solid lines are data from Syono and Ishikawa (1963). Dashed lines are data from Fletcher and O’Reilly (1974). where K1 and K2 are empirically determined magnetocrystalline anisotropy constants. In the case of (room temperature) magnetite, K1 is -1.35 x 104 Jm-3. Note that the units of the Ki are in Jm-3, so ϵa is in units of energy per unit volume (an energy density). If you work through the magnetocrystalline equation, you will find ϵa is zero parallel to the  axis, K1∕4 parallel to the  and K1∕3 + K2∕27 parallel to the  direction (the body diagonal). So when K1 is negative, the  direction (body diagonal) has the minimum energy. This is the reason that there is a dimple in the energy surface along that direction in Figure 4.1c. As a consequence of the magnetocrystalline anisotropy energy, once the magnetization is aligned with an easy direction, work must be done to change it. In order to switch from one easy axis to another (e.g. from one direction along the body diagonal to the opposite), the magnetization has to traverse a path over an energy barrier which is the difference between the energy in the easy direction and that in the intervening hard direction. In the case of magnetite at room temperature, we have this energy barrier as ϵ-ϵ or to first order K1∕3 - K1∕4 = K1∕12. Figure 4.3: Magnetization curve for magnetite as a function of temperature. The specimen was placed in a very large field, cooled to near absolute zero, then warmed up. The magnetization was measured as it warmed. When it goes through the Verwey transition (~110 K), a fraction of the magnetization is lost. Data downloaded from “w5000” in the Rock magnetic Bestiary collection at the Institute for Rock Magnetism. 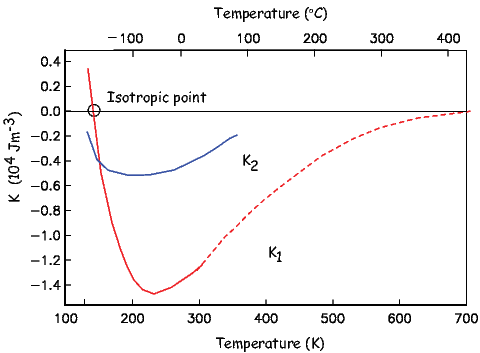 Because electronic interactions depend heavily on inter atomic spacing, magnetocrystalline anisotropy constants are a strong function of temperature (see Figure 4.2). In magnetite, K1 changes sign at a temperature known as the isotropic point. At the isotropic point, there is no large magnetocrystalline anisotropy. The large energy barriers that act to keep the magnetizations parallel to the body diagonal are gone and the spins can wander more freely through the crystal. Below the isotropic point, the energy barriers rise again, but with a different topology in which the crystal axes are the energy minima and the body diagonals are the high energy states. At room temperature, electrons hop freely between the ferrous and ferric ions on the B lattice sites, so there is no order. Below about 120 K, there is an ordered arrangement of the ferrous and ferric ions. Because of the difference in size between the two, the lattice of the unit cell becomes slightly distorted and becomes monoclinic instead of cubic. This transition occurs at what is is known as the Verwey temperature (Tv). Although the isotropic point (measured magnetically) and the Verwey transition (measured electrically) are separated in temperature by about 15o, they are related phenomena (the ordering and electron hopping cause the change in K1). The change in magnetocrystalline anisotropy at low temperature can have a profound effect on the magnetization. In Figure 4.3 we show a typical (de)magnetization curve for magnetite taken from the “Rock magnetic bestiary” web site maintained at the Institute for Rock Magnetism: http://irm.umn.edu/bestiary. There is a loss of magnetization at around 100 K. This loss is the basis for low-temperature demagnetization (LTD). However, some portion of the magnetization always remains after low temperature cycling (called the low temperature memory), so the general utility of LTD may be limited. Here the magnetocrystalline constants have been designated Ku1,Ku2 to distinguish them from K1,K2 used before. In this equation, when the largest uniaxial anisotropy constant, Ku1, is negative, the magnetization is constrained to lie perpendicular to the axis of symmetry. When Ku1 > 0, the magnetization lies parallel to it. An example of a mineral dominated by uniaxial symmetry is hematite, a mineral with hexagonal crystal symmetry. 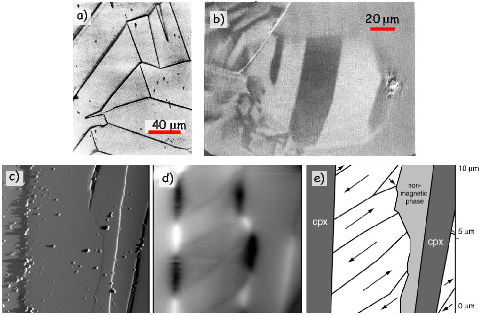 The magnetization of hematite is quite complicated, as we shall learn in Chapters 6 and 7, but one source is magnetization is spin-canting (see Chapter 3) within the basal plane of the hexagonal crystal. Within the basal plane, the anisotropy constant is very low and the magnetization wanders fairly freely. However, the anisotropy energy away from the basal plane is strong, so the magnetization is constrained to lie within the basal plane. so λ for magnetite is about 38 x 10-6. Stress has units of Nm-2 which have the same fundamental units as Jm-3, so λ is dimensionless. Note the similarity in form of magnetostriction and uniaxial anisotropy giving rise to a single “easy axis” within the crystal. Figure 4.4: a) Internal magnetizations within a ferromagnetic crystal. b) Generation of an identical external field from a series of surface monopoles. c) The internal “demagnetizing” field resulting from the surface monopoles. [Redrawn from O’Reilly, 1984]. d) Surface monopoles on a sphere. e) Surface monopoles on an ellipse, with the magnetization parallel to the elongation. f) Demagnetizing field Hd resulting from magnetization M at angle θ from a axis in prolate ellipsoid. where N is a demagnetizing factor determined by the shape. In fact, the demagnetizing factor depends on the orientation of M within the crystal and therefore is a tensor (see Appendix A.3.5 for review of tensors). The more general equation is Hd = N ⋅ M where Hd and M are vectors and N is a 3 x 3 tensor. For now, we will simplify things by considering the isotropic case of a sphere in which N reduces to the single value scalar quantity N.
so substituting and solving for Hd we get Hd = -1 3M, hence N = 1 3. Different directions within a non-spherical crystal will have different distributions of free poles (see Figures 4.4e,f). In fact the surface density of free poles is given by σm = M ⋅ . Because the surface pole density depends on the direction of magnetization, so too will N. In the case of a prolate ellipsoid magnetized parallel to the elongation axis a (Figure 4.4e), the free poles are farther apart than across the grain, hence, intuitively, the demagnetizing field, which depends on 1∕r2, must be less than in the case of a sphere. Thus, Na <1 3. Similarly, if the ellipsoid is magnetized along b (Figure 4.4e), the demagnetizing field is stronger or Nb > 1 3. The two terms in Equation 4.4 are the by now familiar magnetostatic energy density ϵm, and the magnetostatic self energy density or the demagnetizing energy density ϵd. ϵd can be estimated by “building” a magnetic particle and considering the potential energy gained by each incremental volume dv as it is brought in (-μoMdv ⋅ Hd) and integrating. The 1 2 appears in order to avoid counting each volume element twice and the v disappears because all the energies we have been discussing are energy densities – the energy per unit volume. Note that the demagnetizing energy in Equation 4.6 has a uniaxial form, directionally dependent only on θ, with the constant of uniaxial anisotropy Ku = 1 2ΔNμoM2. ΔN is the difference between the largest and smallest values of the demagnetizing tensor Nc - Na. For a prolate ellipsoid Nc = Nb and choosing for example c∕a = 1.5 we find that Na -Nc =~ 0.16. The magnetization of magnetite is 480 kAm-1, so Ku ≃ 2.7 x 104 Jm-3. This is somewhat larger than the absolute value of K1 for magnetocrystalline anisotropy in magnetite (K1= -1.35 x 104 Jm-3), so the magnetization for even slightly elongate grains will be dominated by uniaxial anistropy controlled by shape. Minerals with low saturation magnetizations (like hematite) will not be prone to shape dominated magnetic anisotropy, however. Figure 4.6: A variety of domain structures of a given particle. a) Uniformly magnetized (single domain). [Adapted from Tipler, 1999.] b) Two domains. c) Four domains in a lamellar pattern. d) Essentially two domains with two closure domains. So far we have been discussing hypothetical magnetic particles that are uniformly magnetized. Particles with strong magnetizations (like magnetite) have self energies that quickly become quite large because of the dependence on the square of the magnetization. We have been learning about several mechanisms that tend to align magnetic spins. In fact in very small particles of magnetite (< 40 nm), the spins are essentially lined up. The particle is uniformly magnetized and we called it single domain (SD). In larger particles (~80 nm) the self energy exceeds the other exchange and magnetocrystalline energies and crystals have distinctly non-uniform states of magnetization. There are many strategies possible for magnetic particles to reduce self energy. Numerical models (called micromagnetic models) can find internal magnetization configurations that minimize the energies discussed in the preceding sections. Micromagnetic simulations for magnetite particles (e.g. Schabes and Bertram, 1988) allow us to peer into the state of magnetization inside magnetic particles. These simulations give a picture of increasing complexity from so-called flower to vortex (Figure 4.5) remanent states. These particles share many properties of the uniformly magnetized single domain particles and are called pseudo-single domain (PSD) particles. As particles grow larger (>~200 nm), they break into multiple magnetic domains, separated by narrow zones of rapidly changing spin directions called domain walls. Magnetic domains can take many forms. We illustrate a few in Figure 4.6. The uniform case (single domain) is shown in Figure 4.6a. The external field is very large because the free poles are far apart (at opposite ends of the particle). When the particle organizes itself into two domains (Figure 4.6b), the external field is reduced by about a factor of two. In the case of four lamellar domains (Figure 4.6c), the external field is quite small. The introduction of closure domains as in Figure 4.6d reduces the external field to nothing. Figure 4.7: Examples of possible domain walls. a) There is a 180∘ switch from one atom to the next. The domain wall is very thin, but the exchange price is very high. b) There is a more gradual switch from one direction to the other [note: each arrow represents several 10’s of unit cells]. The exchange energy price is lower, but there are more spins in unfavorable directions from a magnetocrystalline point of view. where A is the exchange constant (see Section 4.1.1) and K is the magnetic anisotropy constant (e.g., Ku or K1). Note that ϵw is the energy density per unit wall area, not per volume. Plugging in values for magnetite given previously we get δw = 90 nm and ϵw = 3x 10-3Jm-2. In Figure 4.8 we plot the self energy (Equation 4.12) and the wall energy (ϵw from Equation 4.9) for spheres of magnetite. We see that the wall energy in particles with diameters of some 50 nm is less than the self energy, yet the width of the walls about twice as wide as that. So the smallest wall is really more like the vortex state and it is only for particles larger than a few tenths of a micron that true domains separated by discrete walls can form. Interestingly, this is precisely what is predicted from micromagnetic modelling (e.g., Figure 4.5). 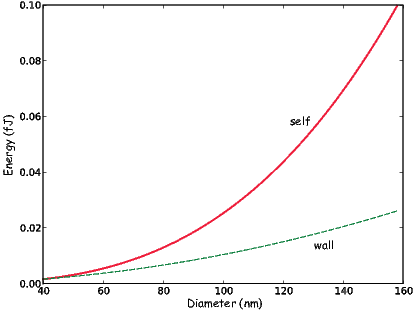 Figure 4.8: Comparison of “self” energy versus the energy of the domain wall in magnetite spheres as a function of particle size. How can we test the theoretical predictions of domain theory? Do domains really exist? Are they the size and shape we expect? Are there as many as we would expect? In order to address these questions we require a way of imaging magnetic domains. Bitter (1931) devised a way for doing just that. Magnetic domain walls are regions with large stray fields (as opposed to domains in which the spins are usually parallel to the sides of the crystals to minimize stray fields). In the Bitter technique magnetic colloid material is drawn to the regions of high field gradients on highly polished sections allowing the domain walls to be observed (see Figure 4.9a). Figure 4.9: a) Bitter patterns from an oriented polished section of magnetite. [Figure from �zdemir et al., 1995]. 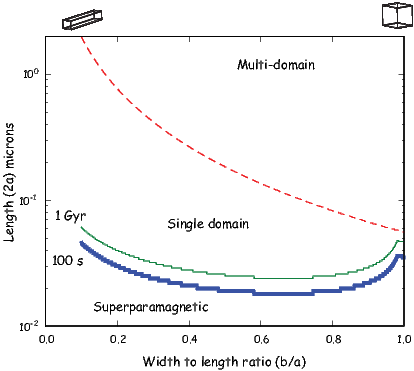 b) Domains revealed by longitudinal magneto-optical Kerr effect. [Image from Heider and Hoffmann, 1992.] c-e) Magnetic force microscopy technique. [Images from Feinberg et al., 2005.] c) Image of topography of surface of a magnetite inclusion in a non-magnetic matrix. d) Magnetic image from MFM techqnique. e) Interpretation of magnetizations of magnetic domains. Another common method for imaging magnetic domains employs a technique known as magnetic force microscopy. Magnetic force microscopy (MFM) uses a scanning probe microscope that maps out the vertical component of the magnetic fields produced by a highly polished section. The measurements are made with a cantilevered magnetic tip that responds to the magnetic field of the sample. In practice, the measurements are made in two passes. The first establishes the topography of the sample (Figure 4.9c). Then in the second pass, the tip is raised slightly above the surface and by subtracting the topographic only signal the attraction of the magnetic surface can be mapped (Figure 4.9d). Figure 4.9e shows an interpretation of the magnetic directions of different magnetic domains. We know from statistical mechanics that the probability P of finding a grain with a given thermal energy sufficient to overcome some anisotropy energy Ea and change from one easy axis to another is P = exp(-Ea∕ET ). Depending on the temperature, such grains may be quite rare, and we may have to wait some time t for a particle to work itself up to jumping over the energy barrier. where C is a frequency factor with a value of something like 1010 s-1. The anisotropy energy is given by the dominant anisotropy parameter K (either Ku,K1, or λ) times the grain volume v.
Thus, the relaxation time is proportional to anisotropy constant and volume, and is inversely related to temperature. Relaxation time τ varies rapidly with small changes in v and T. To see how this works, we can take Ku for slightly elongate cuboids of magnetite (length to width ratio of 1.3 to 1) and evaluate relaxation time as a function of particle width (see Figure 4.10). There is a sharp transition between grains with virtually no stability (τ is on the order of seconds) and grains with stabilities of billions of years. Grains with τ ≃ 102 - 103 seconds have sufficient thermal energy to overcome the anisotropy energy frequently and are unstable on a laboratory time scale. In zero field, these grain moments will tend to rapidly become random, and in an applied field, also tend to align rapidly with the field. The net magnetization is related to the field by a Langevin function (see Section 3.2.2 in Chapter 3). Therefore, this behavior is quite similar to paramagnetism, hence these grains are called superparamagnetic (SP). Such grains can be distinguished from paramagnets, however, because the field required to saturate the moments is typically much less than a tesla, whereas that for paramagnets can exceed hundreds of tesla. Figure 4.11: Expected domain states for various sizes and shapes of parallelopipeds of magnetite at room temperature. The parameters a and b are as in Figure 4.4e. Heavy blue (thin green) line is the superparamagnetic threshold assuming a relaxation time of 100s (1 Gyr). Dashed red line marks the SD/MD threshold size. Calculations done using assumptions and parameters described in the text. We are now in a position to pull together all the threads we have considered in this chapter and make a plot of what sort of magnetic particles behave as superparamagnets, which should be single domain and which should be multi-domain according to our simple theories. We can estimate the superparamagnetic to single domain threshold for magnetite as a function of particle shape by finding for the length (2a) that gives a relaxation time of 100 seconds as a function of width to length ratio (b∕a) for parallelopipeds of magnetite (heavy blue line in Figure 4.11). To do this, we follow the logic of Evans and McElhinny (1969) and Butler and Banerjee (1975). In this Evans diagram, we estimated relaxation time using Equation 4.11, plugging in values of K as either the magnetocrystalline effective anisotropy constant ( 1_ 12K1) or the shape anisotropy constant (1 2ΔNμoM2), whichever was less. We also show the curve at which relaxation time is equal to 1 Gyr, reinforcing the point that very small changes in crystal size and shape make profound differences in relaxation time. The figure also predicts the boundary between the single domain field and the two domain field, when the energy of a domain wall is less than the self energy of a particle that is uniformly magnetized. This can be done by evaluating wall energy with Equation 4.9 for a wall along the length of a parallelopiped and area (4ab) as compared to the self energy (1 2μoNaM2v) for a given length and width to length ratio. When the wall energy is less than the self energy, we are in the two domain field. Figure 4.11 suggests that there is virtually no SD stability field for equant magnetite; particles are either SP or MD (multi-domain). As the width to length decreases (the particle gets longer), the stability field for SD magnetite expands. Of course micromagnetic modelling shows that there are several transitional states between uniform magnetization (SD) and MD, i.e. 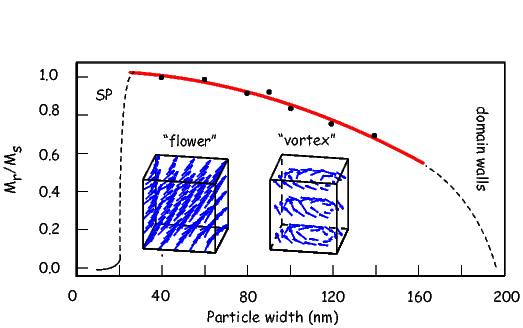 the flower and vortex remaent states (see Fabian et al., 1996), but Figure 4.11 has enormous predictive power and the version of Butler and Banerjee (1975), (which is slightly different in detail) continues to be used extensively. It is worth pointing out however, that the size at which domain walls appear in magnetite is poorly constrained because it depends critically on the exact shape of the particle, its state of stress and even its history of exposure to past fields. Estimates in the literature range from as small as 20 nm to much larger (up to 100 nm) depending on how the estimates are made. Nonetheless, it is probably true that truly single domain magnetite is quite rare in nature, yet more complicated states are difficult to treat theoretically. Therefore most paleomagnetic studies rely on predictions made for single domain particles. SUPPLEMENTAL READING: Dunlop and �zdemir (1997), Chapters 2.8 and 5.
b) Magnetostatic (shape) anisotropy energy for an ellipsoid whose principal semi-axis is 1 μm and whose major and minor semi-axes are each 0.25 μm. You may use the “nearly spherical” approximation in the text. c) The critical radius of a sphere at which wall energy equals self energy. Calculate grain diameter for magnetite spheres with τs of 10-1, 10, 102, 103, 105, 109, 1015 seconds. Use values for Boltzmann’s constant, C (the frequency factor) and |K1| at room temperature (300K). a) Consider a highly elongate rod (needle-shaped grain) of magnetite. Explain why the demagnetizing factor along the long axis of the rod is about zero while that across the long axis is about one half. b) The file Chapter_4/prolate.txt gives the values of demagnetizing factors for a prolate ellipsoid (with axes a> b=c). For an elongate rod of magnetite with range of aspect ratios (AR = c:b) provided in the table, plot the magnetostatic self energy density in the absence of an external field. Use this plot to estimate the aspect ratio at which shape anisotropy will be equal that of magnetocrystalline anisotropy (use a value of K1 at room temperature (300K) of -1.43 x 104 J/m3). c) What is the maximum microscopic coercivity (Hk) for such an elongate grain of magnetite (assume an infinitely long grain)? Coercivities are more commonly reported in units of T so provide this corresponding value as well.